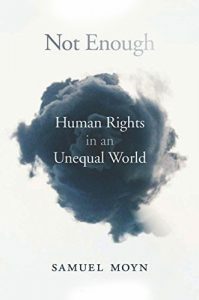 Moyn’s most recent book, Not Enough: Human Rights in an Unequal World, tries to have it both ways in several regards. Its title clearly marks it as a polemic; its jacket says it “calls for more ambitious ideals and movements.” Moyn believes an even more expansive moral ideal should replace human rights. He contrasts sufficiency, a threshold of fundamental rights or needs based in common dignity, with equality, here purely material, a parity of economic outcomes regardless of input. This goes further than the old dictum of “to each according to need,” for it also prescribes a specific kind of distribution after everyone’s needs have been met (and, Moyn notes, because differing needs don’t affect it). And yet when asked to “make the case for equality,” Moyn demurs, calling Not Enough “a history book.” What would be enough? Enough for what? Why? These questions are never convincingly answered. [Singer] homogenized foreign suffering regardless of its cause; its roots in endemic poverty, natural disaster, and civil war were apparently not philosophically relevant. Singer’s approach … was explicitly framed to single out for attention the most grievous wrongs, whether natural or political, for succor.… [H]e consciously distinguished his argument from what might ensue if one applied his principle across the board instead of merely in response to horrendous spectacle, and made no general call for equality of distribution of the good things in life.… Singer’s ethics then and later dictated not institutional criticism of the world order—whether of post-colonial geopolitics or global distribution—but personal charity. In general, “homogenizing” renders a theory strictly stronger; it is precisely by treating different things in the same way that a theory garners explanatory power. Like scientific theories, all ethical theories have this feature. Now perhaps Moyn agrees with law and philosophy professor Brian Leiter that “Marxism still does not need normative theory.” But if it has no normative theory, why do most of Moyn’s critiques seem to be on normative grounds? The only exception is a set of references, late in the book, to populist movements. But those just muddy the waters further. In a study that claims to be simply historical, the criticism that there is “no general call for equality of distribution” must be grounded in a sense that such a call is respectable on the terms of already-existing ethical theory. I have discussed elsewhere the confusions inherent in common left-wing responses to Singer and the effective altruists who hew to his philanthropic model. Despite it being clearly within his capabilities, Moyn forgoes the task of critically examining such responses. He does not discuss prioritarianism, an ethical theory that reflects intuitions about inequality without making a myopic and arbitrary focus on equality its center. Nor, in emphasizing collective over personal action, does he engage with the debates among ethicists and other philosophers about shared agency. The idea that there might be substantive theoretical problems with such notions somehow seems never to come up. He doesn’t even seem to allow that normative ethics for individuals might be separable from political philosophy; such distinctions seem inconsequential to the kind of intellectual history being done. It’s not only that some readers will be unconvinced that sufficiency is not enough; other readers will be unconvinced that Moyn’s chosen equality is enough. Moyn focuses on material equality at a particular time. But why material equality? Why not symbolic, emotional, reproductive, or anything else? In particular, Moyn neglects to mention the “capabilities approach” of Martha Nussbaum and Amartya Sen, despite the fact that Sen is a relatively important character in several of Moyn’s mini-histories. And why should equality at a time satisfy us? My life is far more safe and comfortable than the lives of the vast majority of humans who have come before me. (Moyn may disagree with this—see his review of Steven Pinker’s Enlightenment Now.) If equality per se were a value, it might be incumbent upon me to reduce my levels of safety and comfort however possible, to match those of the dead when they lived. That almost nobody (including Moyn) seems to think I have this obligation suggests that some or another equalizing act is only worthwhile insofar as it actually raises someone up. This is a very significant limitation on the concept. Moyn’s aversion to positive argument also means he avoids even the most natural historian’s rebuttal to sufficiency-based ethics, which is that what counts as enough to meet the basic threshold of human rights (or dignity, or whatever) seems to change depending on the broader resources available. If justice really depended on an essential human nature, such changes would be anathema. But the sufficiency Moyn derides as insufficient seems to be constantly updating: the right to an education, the right to Internet access, to free movement, to cutting-edge medical treatment; in the other direction, it may be difficult to think there was a right to free speech when homo sapiens was a band only a few thousand strong trying to survive apex predators in the Horn of Africa. It is never demonstrated that equality is strictly more expansive than sufficiency. The human rights abuses of rhetorically egalitarian regimes are treated like a neoliberal talking point; Stalin is barely mentioned, Mao not at all. Most egregious is Moyn’s treatment of postcolonial “peoples.” He praises the 1970s New International Economic Order as a bold though ultimately unsuccessful step toward global equality. Honest enough to confront the fact that many leaders calling for more equality among nations sponsored little equality, and little respect for human rights, within their own borders, he nevertheless retreats to the language of public relations to address it: the “neglect of internal distribution” was an “ethically sensitive vulnerability,” euphemisms that would make a neoliberal corporate media officer blush. This vulnerability, he says, was exploited opportunistically by inegalitarian neoliberals. But aren’t the hypocritical leaders the real opportunists in this story? The righteous socialist opprobrium disappears so quickly. Another point of inconsistency or indecision comes in the consideration of “growth.” Moyn views it positively when an element of planned economies and postcolonial thinking; for neoliberals, though, there’s a “religion of growth.” Most of the economic ideas in the book come from old-style dependency theory. As with the ethical disputes, the idea that empirical disputes in economic theory occurred in good faith seems to be verboten. By refusing to substantively engage ethical theory, Moyn, like some other leftists, gives the impression that his favored political system will somehow make tradeoffs and compromises at any level unnecessary. He cites Emmanuel Levinas, the subject of his dissertation and an avatar of the “ethical turn,” for what he calls a paradox: “‘Personal freedom is inconceivable without economic liberation … while the organization of economic freedom is not possible without an enslavement for the moral person.’” This is no paradox, however; either it implies that personal freedom is impossible, or it’s just what happens with all values, whether framed as rights or something else: they end up balanced, however mysteriously, against other values. Levinas no more expresses a paradox than Garfield the cat does in saying, “Sleeping makes me hungry and eating makes me sleepy.” We see how Moyn’s genealogical project runs together logical, empirical, ethical, and strategical concepts, giving practicality the force of proof and giving reasoned investigation the air of propaganda. And Moyn’s project is indeed genealogy, in the classic Nietzschean/Foucauldian sense. His starting point remains the idea of the “contingent … formation” of human rights doctrine in philosophy, law, and politics. Reviewing Jeremy Waldron’s challenges to the ethical basis of equality, Moyn falls back on old chestnuts: “morality is constructed in different ways over time and space,” so equality is “primarily a decision to make rather than a truth to endorse.” Why make it? Under what measure is less than equality “not enough”? Genealogy rules out as a matter of methodology the possibility that its subjects were trying in good faith to figure out moral, conceptual, or empirical truths; then, by a circular logic, its fruits are cited as evidence that such good-faith figurings-out never took place. But it is impossible to understand the work of writers like John Rawls and Peter Singer without understanding that they were trying not just to express some sort of internal decision but to produce a correct ethical theory. Not Enough seems at first to follow a standard pattern from the “hermeneutics of suspicion”: the dominant human rights framework distracts from, obscures, disempowers real leftist politics; it’s a tool of neoliberalism, and has, as the book’s jacket says, “been kindest to the rich.” But Moyn’s final chapter criticizes this view (which he associates with Naomi Klein), calling it “conspiratorial.” The book’s structure and thesis only really become apparent in the conclusion, where we hear that the relationship between human rights and neoliberalism is merely a “correlation” that “needs to be named.” And yet Moyn does not make this need vivid, especially not for those who don’t share his political and theoretical presuppositions. Much respect is due Moyn for his integrity in opposing the “conspiratorialism,” and in crediting both neoliberalism and human rights for lifting people out of poverty. But it leaves the book in yet another quandary. We hear that “human rights … have so far contributed little of note” but then, on the very next page, that they have made “an indubitable contribution.” The whole text is like this, indecisive, torn. Most of all it testifies to how politicization and high theory can compromise an obviously intelligent and expert writer. Despite all this, Moyn’s appetite as a researcher means that even a philosophically rather than politically minded reader will find quite a few items of interest. I found the fifth chapter, “Basic Needs and Human Rights,” especially thought-provoking. Overall, the book is written enjoyably enough, notwithstanding the occasional lawyerly conversion of verbs into nouns (“embarkation,” “connivance”), and some strange clauses (“an unprecedented density … began”) whose irrationalities are obscured by a panoply of prepositional phrases. Chomsky would come in handy here not just for grounding politics in justice but for diagramming the sentences. Narratively speaking, at least for a non-historian, some mention of the material conditions accompanying various intellectual trends might have helped immensely, especially as Moyn emphasizes the importance of such conditions even for less-favored thinkers like Singer. Moyn is fair-minded when it comes to fascist and communist regimes of the early twentieth century: he allows even the very far right some modicum of egalitarianism and humanitarianism when it’s historically appropriate. The Chronicle of Higher Education presents Moyn as one of the leading lights of a new kind of leftist academy. His thorough and thoughtful presentation certainly speaks to his deep historical knowledge and his penetrating insight. But one’s reasons for preferring one ethical theory to another must themselves be ethical reasons, just as scientific reasons determine scientific beliefs and mathematical reasons determine mathematical beliefs. Not Enough always seems to dip its toes in two rivers running in different directions. I encourage Moyn and similar writers to cast off what’s left of constructivism, of Foucault’s genealogy and its winks and whispers of guilt by association, and to marshal the sorts of arguments that might convince the rest of us. History is, to coin a phrase, not enough.